A runner is born (guest post from my sister Cindy!) | So what? Now what? 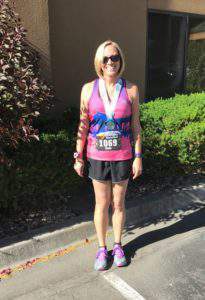 cancer-survivor, and now runner and writer! So without further ado, Cindy describes her first 10K experience. I signed up and paid for two races before this one, but because of injury or illness could not participate in either. I was determined to run in at least one race-sort of a bucket list thing. I told Christie this was the year and I wanted to run a 10K with her. She was very supportive and we both got excited. Christie printed a Hal Higdon novice half marathon training schedule for me which I immediately put on the fridge. As she mentioned in a previous blog she was only going to train to week 9, but a little farther than the 6.2 miles in a 10K. This schedule was assuming you could run three miles at the beginning. I went out for a “practice” run. I could barely run around around the block. I was breathing really hard and sore the next day, and I thought, “this is going to be hard.” I’ve always been a speed walker, but have never run. I realized I needed a VERY beginner schedule and so I printed a beginner 10K schedule for 8 weeks. This schedule assumed you could already run 2 miles. I had a few weeks before I had to start the official training and started practicing by running, walking and then running again for two miles. I was very religious about sticking to my schedule, even though my daughter teased me saying “you really take this training serious, mom!” It never got really easy for me, but I was always proud (and relieved) when I finished running. Some runs were easier than others and I tried to figure out what was different; food sleep or drink? But I could never pinpoint anything. I’m sure one thing against me is I often ended up running in the heat. Anyone who has ever run knows it’s MUCH easier in cool weather. My problem is I’m not a morning person. I’d set my alarm and have good intentions of running early, but often turned off the alarm and went back to sleep. After runs I would often text Christie with my results, good, bad or OK. She always responded positively and told me I could definitely do this! She is a great cheerleader. She would tell me how her runs went and it was a lot of fun to prepare together. On the day before the race I picked up Christie and we drove to Provo together. We registered and then went to a yummy pasta dinner. I didn’t think I was nervous that night, but I may have been because I didn’t sleep well at all. The only time I panicked a little was when Christie told me she eats these runner jelly beans at the beginning and half way through the race. I know it’s silly but I started thinking “Oh no! What if I need fuel and don’t have any!” Christie assured me as long as I did everything the same as in training I would be just fine. And she was right! The first three miles were pretty easy. The weather was perfect and I felt good. The fourth and fifth mile were harder, but I kept going. When I needed to walk for 30 seconds, I walked. I noticed another lady about my same pace the entire race. Around 5 1/2 miles I started to walk and the lady I had noticed said “come on, let’s finish this together!” Well that’s all it took to keep me running and we did cross the finish line together! It was so great to hear my name announced and to see Christie cheering and waving her arms for me! (I wish I could have done the same for her.) Later when I looked at the pictures I was clapping as I finished. I’m not sure if it was because it was over or I was joining the spectators! Either way it felt great!!! Good job, Cindy!!! I’m so impressed!!! We love you too — even if we can’t convert you to the joys of running! How inspiring you are! And you’re a testimonial to the truth that we gain confidence by the doing of a thing! You go girls! Thanks for agreeing to! I love you. This was so inspiring to me! Even though I can’t run because of a permanent injury, maybe I can find a physical goal to get me moving, have fun and feel proud. Thanks Cindy for sharing. I love that you clapped as you crossed the finish line. Life needs more clapping for ourselves and others! I love that Connie: Life needs more clapping for ourselves and others! That’s my new mantra. Love you sister. Slow and steady finishes the race. Bravo to you!